400 Sunday Stashes! That's eight years of Sunday Stash blog posts give or take a few weeks. My goodness, I know that that's a lot of fabric, photos, and time spent writing blog posts. I do sometimes wonder if/when the right time is to mix things up with this Sunday blog post, however I can see that they are often well read blog posts and so I push on. And I do enjoy spreading my love for fabric, and sharing with you my fabric finds. 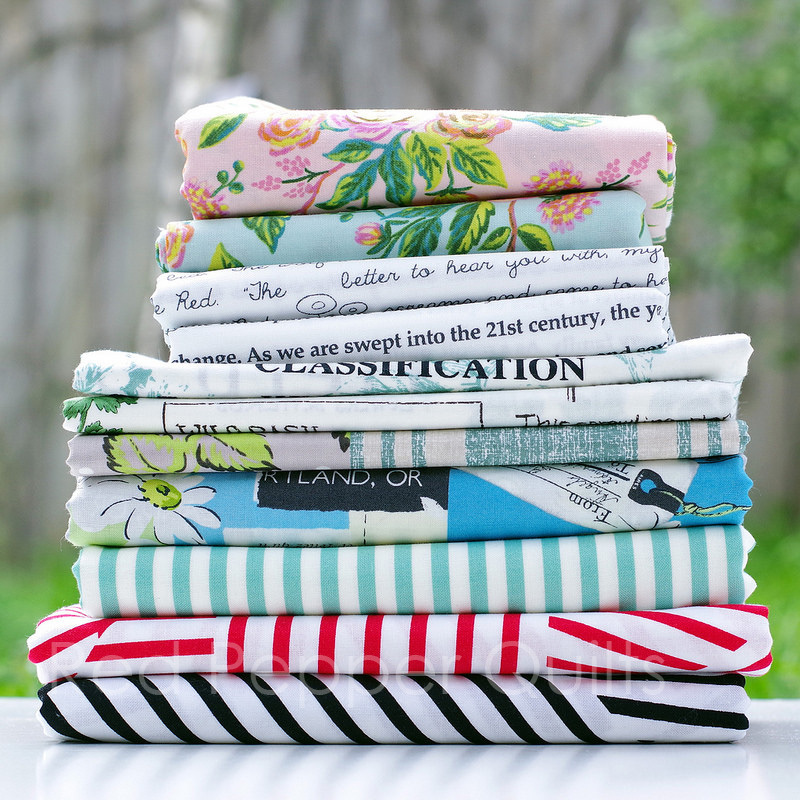 This week's Sunday Stash bundle is a mix of random fabrics handpicked from fabric collections that have recently arrived. The first is a selection of text designs on a clean white background from the Fine Print collection by Brenda Ratliff for RJR Fabrics. I love text fabrics and use them often in my quilts. I especially love the floor plan design, and the dictionary print complete with hand drawn sketches. This collection also includes the same designs printed in white on white (not pictured here). Also included in the bundle are three stripe fabrics. 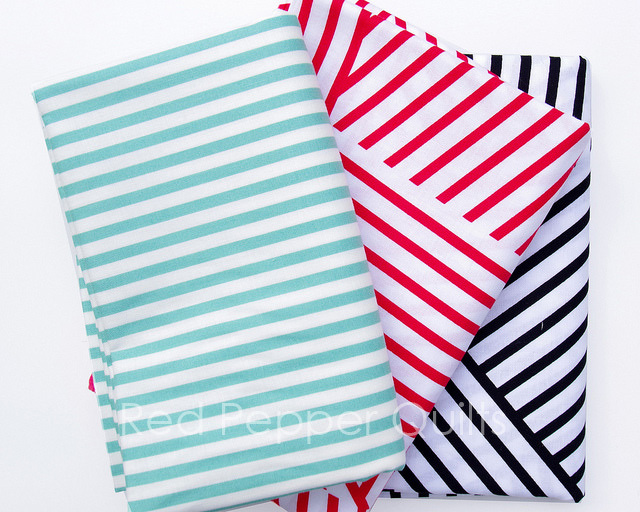 I love a good stripe fabric and these three were chosen for their color and for their irregular design. The lovely blue/green stripe is from the Essentially Yours - Essential Stripe collection by Moda Fabrics in the Caribbean colorway. The two irregular stripes are Manor Stripe fabric from the Mostly Manor collection by Victoria Findlay Wolfe. I also received my order from Miss Matatabi this week. These Japanese fabrics are recently released prints by popular designer Suzuko Koseki for Yuwa Fabrics. These are such beatiful designs, perfect for fussy cutting or adding a unique highlight to a quilt. And they feature text ... and pretty daisies! 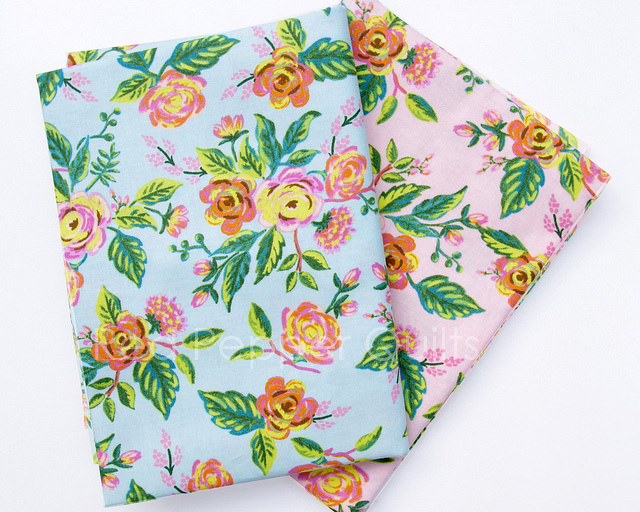 Last, I have added to stash these two medium scale floral prints (quilting cotton) from the Menagerie collection by Rifle Paper Co for Cotton + Steel. I think these are lovely backing (or border) fabrics and I have bought yardage for just that reason. They're so pretty! Please keep doing Sunday Stash! I learn so much. I also shop a lot! 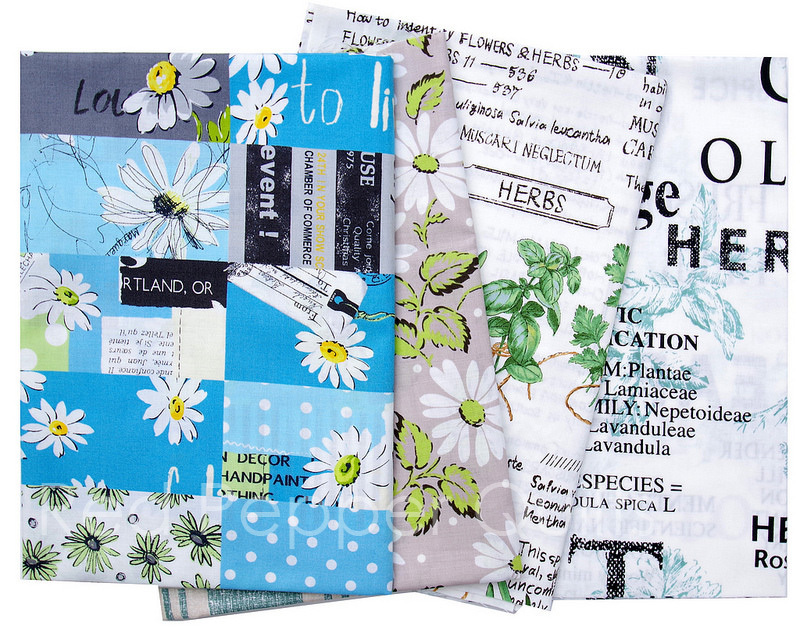 Lovely text prints and I especially like the blue daisy print! Nice assortment! I love your quilts and your fabric choices! I love the Miss Matabi selection and the last two florals Thanks for sharing Rita. That's a pile of some awfully pretty fabrics! Love your fabric round ups. I too love print fabrics, will check out the ones you have recommended. We love Sunday Stash Rita! Like being in a candy store. There is something for everyone in this post! Thank you! Feel free to mix it up and not do the Sunday Stash. However sharing your fabric purchases has introduced me to Lotta Jansdotter, Carolyn Friedlander and Charley Harper and I really like their styles. If you want to show us your fabrics on a different basis that is fine.Take the Sunday off if you choose. However you do it, please keep spreading the fabric love, although for someone who loves fabric and your quilts I do look forward to Sunday Stash, always a lovely read - thankyou so much for sharing! 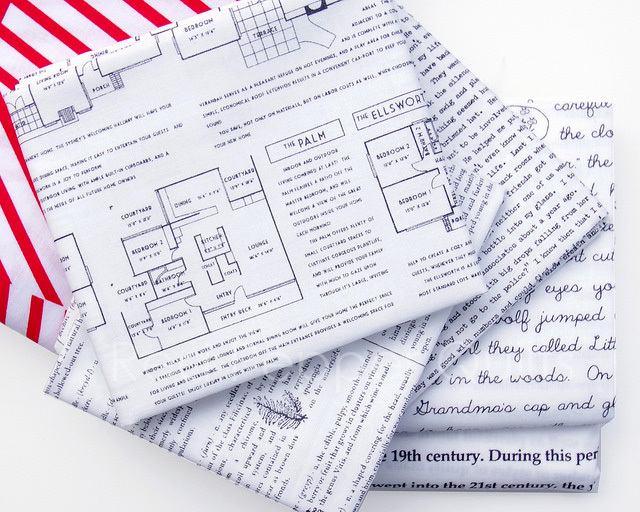 I have fallen in love with the floor plan design and the dictionary print! Thanks for showcasing them; I didn't know they existed! I have enjoyed all of them. I hope that you can continue to share all of the amazing treasures that you find. I agree with the comments above, you have indeed guided me to some collections and fabrics I would have missed along the way.